Cucurbita pepo is also called field pumpkin, summer squash, zucchini, vegetable marrow, courgette, acorn squash. It has been domesticated in the New World for thousands of years. The Zuni people have several uses for this plant. Some authors maintain that Cucurbita pepo is derived from Cucurbita texana, while others suggest that Cucurbita texana is merely feral Cucurbita pepo. They have a wide variety of uses, especially as a food source and for medical conditions. Cucurbita pepo seems to more closely related to Cucurbita fraterna, though disagreements exist about the exact nature of that connection, too. 2) that Cucurbita texana is merely feral Cucurbita pepo. A more recent theory by botanist Thomas Andres in 1987 is that descendants of Cucurbita fraterna hybridized with Cucurbita texana, resulting in two distinct domestication events in two different areas: one in Mexico and one in the eastern United States, with Cucurbita fraterna and Cucurbita texana, respectively, as the ancestral species. Cucurbita pepo may have appeared in the Old World before moving from Mexico into South America. It is found from sea level to slightly above 2,000 meters (6,600 ft). - Scientific name: Cucurbita pepo L.
- Common names in English: pumpkin, field pumpkin, summer squash, autumn squash, marrow, zucchini, courgette, crookneck, pattypan, scallop squash, acorn squash, spaghetti squash, pomion, ornamental gourd. Cucurbita hybrida Bertol. ex Naudin. Cucurbita succado Nägeli ex Naudin. Due to their varied genetic background, members of Cucurbita pepo vary widely in appearance, primarily in regards to their fruits. Within Cucurbita pepo, the pumpkins, scallops, and possibly crooknecks are ancient and were domesticated separately. The domesticated species have larger fruits and larger yet fewer seeds. Parthenocarpy is known to occur in certain cultivars of Cucurbita pepo. They are found from sea level to slightly above 2,000 m (6,600 ft). Cucurbita pepo has creeping plants which are compact or semi-shrubby, annual, monoecious and pubescent-scabrous. The plants are typically 1.0-2.5 feet high, 2-3 feet wide, and have yellow flowers. Stems and leaves of many cultivars bear fine, glassy prickles. Tendrils have two to six branchlets, or are simple and little developed tendrils in the semi-shrubby types. The leaves are broadly ovate-cordate to triangular-cordate. They have 3-5 lobes and are 20-35 centimeters (8-14 in) wide, with or without white spots, often with three to five deep lobules, and with denticulate to serrate denticulate margins. The leaf colors are solid dark green or yellow-green or with grey-green markings. Long leaf-stalks hold the leaf blades above flowers and fruits. Separate male and female flowers are borne on the same plant. The flowers are large, showy, bright yellow/orange. It has pentamerous, solitary, axillary flowers, the males of which have pedicels 7 to 20 cm in length, a campanulate calyx of 9 to 12 mm, linear sepals of 12 to 25 x 1 to 2 mm, a tubular/campanulate corolla, 5 to 10 cm long, which is divided into five for up to one-third or more of its length; and three stamens. The female flowers have sturdy, sulcated pedicels of 2 to 5 cm; the ovary is globose, oblate, ovoid, cylindrical, rarely piriform, smooth, ribbed or verrucose and multilocular; and the calyx is very small. The fruit stems (peduncles) are not corky and are ridged all around, widening slightly at the base. The fruit is very variable in size, shape, colour and texture: smooth to heavily ribbed, often verrucose and rarely smooth, with a rigid skin varying in colour from light to dark green, plain to minutely speckled with cream or green contrasting with yellow, orange or two-coloured. The flesh is pulpy, cream to yellowish or pale orange; it ranges from soft and not bitter to fibrous and bitter. Fruits of wild plants are normally bitter. The fruit has numerous seeds which are narrowly or broadly elliptical or rarely orbicular, slightly flattened and 3 to 20 x 4 to 12 mm, with one end slightly more pointed than the other. Cucurbita pepo is native to North America (northeastern Mexico and southern USA). Cucurbita pepo is one of the oldest, if not the oldest, domesticated species with the oldest known locations being Oaxaca, Mexico, 8,000-10,000 years ago, and Ocampo, Tamaulipas, Mexico, about 7,000 years ago. It is known to have appeared in Missouri, United States, at least 4,000 years ago. A vine native to Mexico and the USA, Cucurbita pepo has been domesticated for thousands of years and is the source of an astonishing variety of cultivated forms, including Halloween pumpkins, courgettes (zucchini) and squashes. Cucurbita pepo has been cultivated for its edible fruits for thousands of years and remains a crop plant of great economic importance today. The morphological differences within the species Cucurbita pepo are so vast, its various subspecies and cultivars have been misidentified as totally separate species. These vast differences are rooted in its widespread geographic distribution. Cucurbita pepo is one of the oldest, if not the oldest domesticated species. The oldest known locations are in southern Mexico in Oaxaca 8,000-10,000 years ago and Ocampo, Tamaulipas, Mexico about 7,000 years ago. Its ancient territory extended north into Texas and up the Greater Mississippi River Valley into Illinois and east to Florida, and possibly even to Maine. It is known to have appeared in Missouri at least 4,000 years ago. Some varieties grow in arid regions and some in moist regions. Acorn squash (Cucurbita pepo var. turbinata), also called pepper squash or Des Moines squash, is a winter squash with distinctive longitudinal ridges and sweet, yellow-orange flesh. Although considered a winter squash, acorn squash belongs to the same species as all summer squashes (including zucchini and yellow crookneck squash). Acorn Squash is commonly mistaken as a gourd. This is a summer squash, shrubby plant, with yellow, golden, or white fruit which is long and curved at the end and generally has a verrucose (wart-covered) rind, ex: Yellow crookneck squash. This is a summer squash, prefers half-shrubby habitat, flattened or slightly discoidal shape, with undulations or equatorial edges, ex: Pattypan squash. 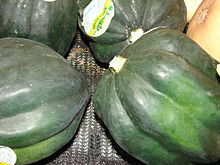 This is a summer and winter squashes, creeper traits and a semi-shrub, cream to dark green color, short round fruit with a slightly broad apex, ex: Spaghetti squash (a winter variety). ﻿This is a summer squash, presently the most common group of cultivars, origin is recent (19th century), semi-shrubby, cylindrical fruit with a mostly consistent diameter, similar to fastigata, ex: Zucchini. 3- Cucurbita pepo var. verrucosa (round warty gourds), ornamental gourds found in Texas and called var. texana and ornamental gourds found outside of Texas (Illinois, Missouri, Arkansas, Oklahoma, and Louisiana) are called var. ozarkana. See Video about: How to Grow Pumpkin - Libby's Pumpkin.